There is nothing better then a beautiful day at the pool with some of your favorite people; floating, sun-bathing and sipping on something fruity. I wanted to share a few must have pool accessories to make any day at the pool perfect! Enjoy! 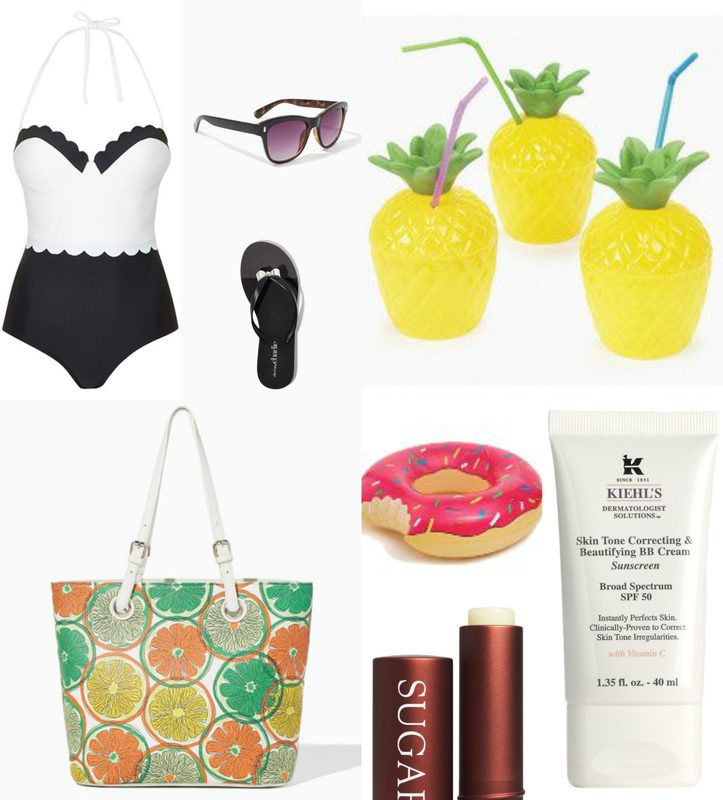 TopShop Swimsuit– I am totally obsessed with this suit and it has been perfect for my days at the pool with Riley. I didn’t feel comfortable rocking a bikini with him at the community pool so I went with an adorable one piece instead. If your size isn’t available (I went up 2 sizes) TopShop has so many other fab options! Charming Charlie Sunnies– I love all cat eye sunnies and at $9 you can’t go wrong adding a pair to your pool bag. Charming Charlie Bow Sandals– I’ve talked about these before and I still love them. Easy to throw on with any suit and perfect for the pool. Pineapple Sippies– Pineapple cups for you and all your friends. Enough said. Get these! Charming Charlie Tote-How adorable is this citrus tote as your pool bag?! Since my straw one is unavailable for you all I thought I would share one that’s on my wishlist and it just got marked down. Adorbs! Donut Floatie– I know these are allll over your insta feeds but this one is actually affordable so get it, you’ll be glad you did! Fresh Sugar Lip Balm– Don’t forget your lips can burn too and this is the best lip balm ever and has 15SPF. Get it! Kiehl’s BB Cream 50SPF– You guys this is the best! I am so happy I found this! If you’re like me, you don’t go anywhere without some make-up on and for the pool you HAVE to protect your face but most make-up only has a little SPF, ah! Burn now=wrinkles later=no thank you! This comes in a 5 shades and since I already have some color on my face the Medium was perfect. If you don’t then go with the light. You can re-apply it every 2 hours when you’re outside for maximum sun protection and some coverage as well. Just add your favorite cover-up and music and you’re ready for a fab day! Oh and in case you get a little sunburned, make sure you use a lotion that will heal your skin, like this one by Fresh. It is amazing and totally soothed my skin after my first pool day burn! 🙂 I love all their products! Go try and sample for yourself if you don’t believe me, you’ll love it all! Thanks for stopping by and have a sunny summer! You’re so cute Madeline! And you’re awesome at this whole fashion thing!